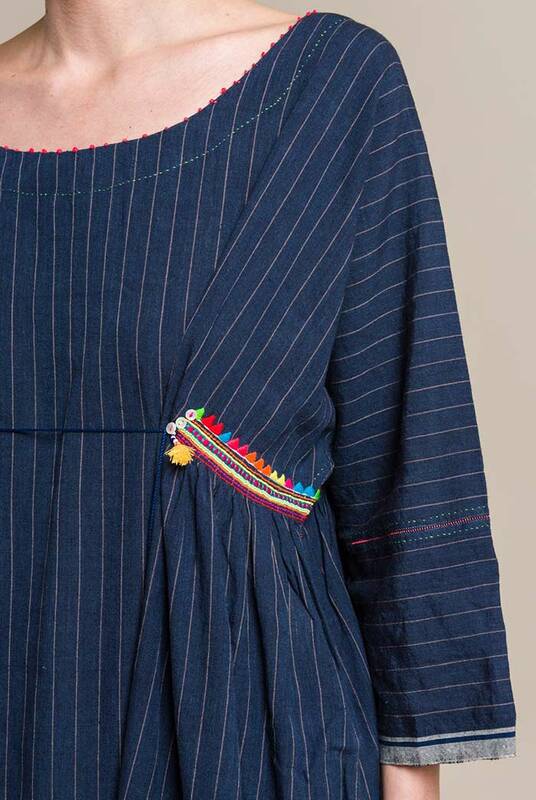 Detailed hand stitchery, crochet flowers, beads, and embroidered hearts are special details often added to Péro clothing. This season drew inspiration from cultures across the world, specifically Latin America and indigenous minorities of China. Aneeth Arora’s thought process was recorded in a journal she kept; it was filled with pictures, pocket maps, tickets, stamps, notes, and other pieces from her journeys. A note wondered if florals would work in winter while another was about appreciating male style being represented in other cultures. This detailed account was what fueled Aneeth’s inspiration for the Péro Fall/Winter 2017 collection. 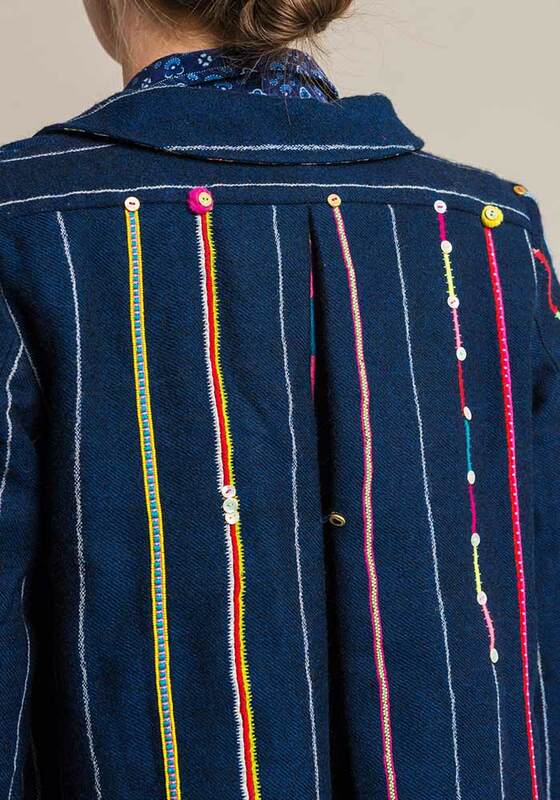 The Miao people of China spoke to the Péro love of detail with their colorful tassels, pompoms, and beading. Another form of detailed work seen in China was neon geometric embroidery on indigo, whereas Latin America had garments decorated with large floral embroideries. These inspired Aneeth to explore the idea of merging aspects of two different traditions in the Péro aesthetic. 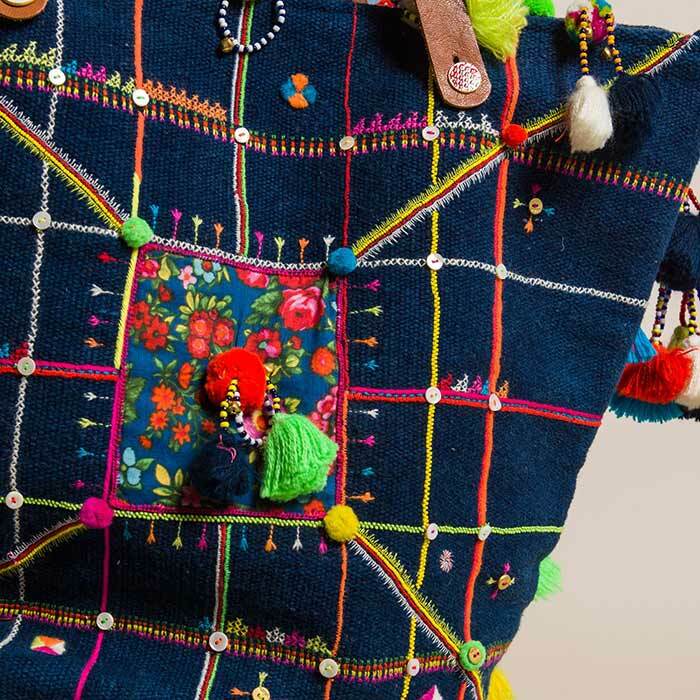 Aneeth Arora is known to travel to different parts of India to discover unique and traditional textiles and techniques to be incorporated; this was one of the initial intentions when starting Péro. 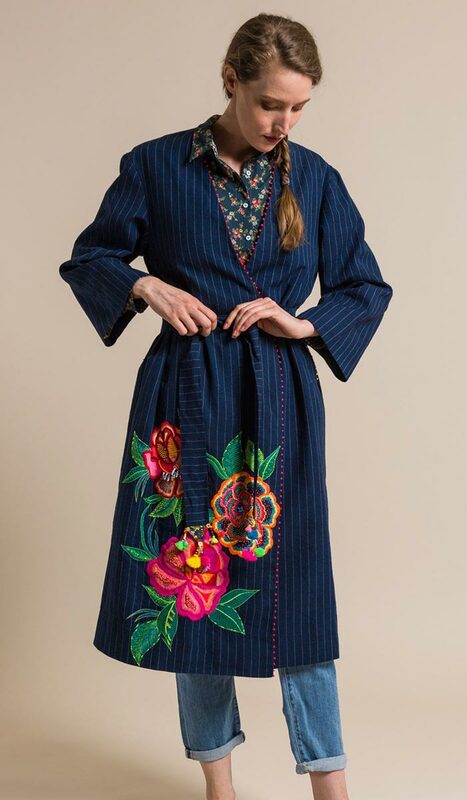 While the indigo with bright florals and neon detailing was strongly influenced by these cultures, it was a natural fit with the production process of Péro. Each piece goes through multiple dedicated and skilled craftspeople before it is completed. This collection was made entirely in India, as all collections prior to this one. The employees of Péro are a part of the “p é r o family,” as entitled by their Facebook photo album that brings recognition to the real people behind the company. Anita rout is one who has every garment pass through her hands because she attaches the labels. Jakir Dada creates the embroidered heart; Baby ji attaches the pompoms, tassels, and buttons; and Nandini makes the crochet flowers and bead details. Each member’s story is heartfelt in telling of their past, how they came to enjoy or learn their craft, hobbies outside of work, favorite tasks in their job, or simply recognition. It expresses how each person is valued for their contribution, no matter how small.